The National Clean-up Day has been welcomed by members of the public as a noble idea meant to promote a clean and health nation. Scores of volunteers from various stakeholders heeded the call by President Emmerson Mnangagwa to inculcate a sense of cleanliness and clean environments by undertaking the campaign. In a snap survey by the ZBC News in the capital city revealed that as early as 8am scores of volunteers supported by several stakeholders were already cleaning the streets of Harare. Simon Vengai Muzenda bus terminus popularly known as 'kuna fourth' was the centre of main activities as Premier Service Medical Aid Society (PSMAS) and TelOne employees were clearing garbage. Relations manager Mr Author Choga underscored the need to keep clean environments as it promotes good health. The same message was echoed by TelOne acting corporate communications head, Hazel Ndebele. Commander Air Force of Zimbabwe Air Marshall Elson Moyo also weighed in by encouraging soldiers to keep their surroundings clean. Stakeholders hailed the initiative and pledged to continue supporting the programme. Among them was National Director of Shungu Dzevanhu Children's Home Reverend Sister Mercy Mutyambizi who urged youths to jealously guard the environment as they are the leaders of tomorrow. "Today we here at Hatfield Shopping Centre cleaning and the message to these youths is to keep the environment clean as they are the leaders of tomorrow," she said. It is hoped the programme which was launched by President Mnangagwa on the 5th of December 2018 will continue to gain popularity until a time when every citizen is cognisant of the need to keep environments clean. In Bindura, clean-p campaign recorded a considerable turn out amid calls for council to put more efforts in collecting garbage as residents described lack of refuse collection in the town as a major challenge. Bindura residents, companies and government agencies turned out to clean-up the environment in keeping with the tradition that began last December. People who spoke to the ZBC News once more reiterated calls for council to regularly collect garbage as uncollected refuse has become the major cause of dirt. "The clean-up is good but council should collect garbage, outside the clean-up they don't even come," said some of the residents. Minister of State for Provincial Affairs in Mashonaland Central Senator Monica Mavhunga commended people in the province for maintaining the momentum of the clean-up drive. "Today we saw the people of Bindura eager to support the programme, civil servants came out we reached out to this place outside Bindura Primary School which was littered with dirt," she said. The Environmental Management Agency (EMA) has since created a database of key persons in all institutions to lead in cleaning their respective areas. "We are happy, through this we have managed to keep the interest rising," said EMA Mashonaland Central provincial manager Mr Robert Rwafa. Solid waste management is one of the key environmental challenges that is confronting many developing countries including Zimbabwe. As part of its social responsibility drive, Chitungwiza Municipality joined the rest of the nation in a clean-up campaign and tree planting project in line with the pronouncement to observe the national day of service by President Mnangagwa. Residents of Chitungwiza embarked on a clean-up campaign and tree planting project at Unit J shops this afternoon. The campaign which was spearheaded by Chitungwiza Municipality, is meant at keeping premises and surroundings clean, thereby preventing diseases like cholera and typhoid. Since every friday is reserved for community work, after cleaning up, Chitungwiza residents also took the opportunity to plant trees in a bid to protect the environment. Speaking to this news crew, the Director of Housing and Community Services for Chitungwiza, Hazel Sithole highlighted that since the country is battling with effects of climate change, tree planting is a significant intervention to the challenges. Plans are afoot by Chitungwiza Municipality to establish a solid waste management utility to ensure that there is better public health for Chitungwiza. 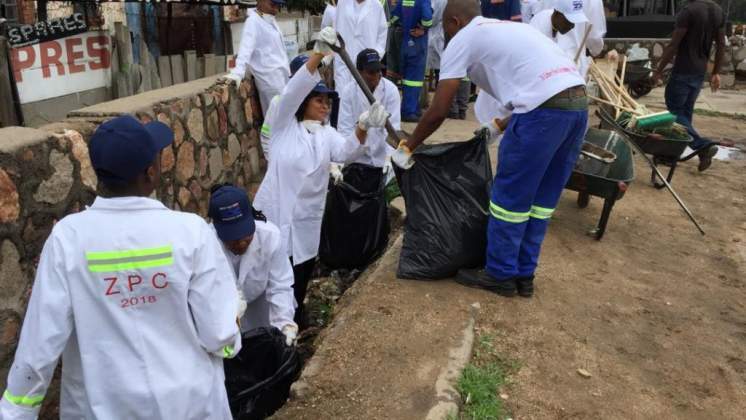 The National Clean-up Campaign was launched by the President, who in November 2018 declared the first Friday of every month a day for national cleaning.